Some clinics may include one or more subject areas. Check schedule for details. NOTE: All Clinics include some horsemanship sessions. Sessions are designed to be informative, yet relaxing and fun for even the most timid rider. Includes a look at basic skills needed to accomplish each clinic focus. Geared towards helping all levels of riders advance with confidence and low stress. Informative sessions geared towards giving riders valuable yet simple tools to handle any “scary” obstacle be it in a show situation or riding outside. Trail I includes in-depth, fundamental horsemanship skills required for controlling challenging situations and basic obstacles with confidence. Trail 2 will have you maneuvering difficult obstacles such as water crossings, rocky terrain, logs, bridges, gates, and more. Trail 3 dives into dragging, shooting, timed trail challenges, extreme trail obstacles and more. Hands-on work includes time spent outdoors, show ring prep, relaxation techniques and tips to calm show jitters, nervous horses and riders. Showmanship & pattern memorization tips for flawless performances will benefit even those whose interest does not include competition settings. Learn to analyze judge’s score sheets and run content in a manner leading to positive performance changes. Glean inside knowledge of showmanship styles, pattern memorization, and walk-through tips. Understand the use of mental preparation and relaxation techniques to calm horse and rider jitters to help you perform flawless trail performances. Learn to use your horse’s natural curiosity to create a picture perfect look on any given obstacle; participate in a practice show! A look into the elements required for versatility ranch horse shows including Ranch Cutting, Ranch Working Cow Horse, Ranch Trail, Ranch Pleasure, Ranch Roping and Ranch Conformation. 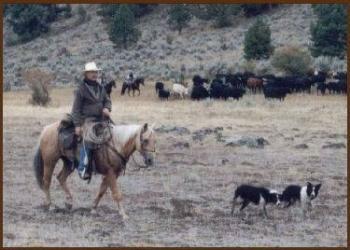 All techniques taught are applicable to real ranch working situations from moving and sorting cattle to pasture doctoring and branding. Learn how to read cattle flight zones, correct rider positioning for control while herding, sorting, turning, driving and roping. This course will cover everything from horse/rider skills to insight into what the judge is looking for in each of the categories performed in ranch horse competitions. Sorters, penners, and cow-horse enthusiasts will find an abundance of helpful information to walk away with as well! 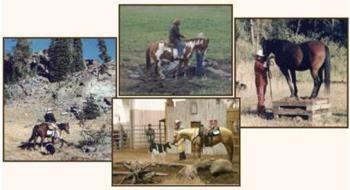 All levels riders welcome, some basic horsemanship skills are required. Ladies Only! For every woman who’s ever dreamed cowgirl dreams, who aspires to learn the fundamentals of horsemanship or wants to advance to a higher level. For you gals desiring the company of other like-minded women, in a relaxing, thought-provoking atmosphere, these clinics will end your search! Join us for a smorgasbord of instruction from all clinics we offer; may include everything from basic to advanced horsemanship, ranch cattle work, ranch roping & sorting, trail competition tips, trail riding, and special requests from clinic participants (anything is possible!). Bring your significant “other” ! These clinics will follow a similar format as the Cowgirl Up! Camps but will be geared towards couples. Bring your sense of humor! More often than not it’s not the obstacle or the cow that’s the problem with your horse, it’s a lack of communication between the two of you that’s creating the problem. Join us here for a look at our techniques for teaching the core foundational horsemanship skills needed to tackle any task, in or out of the arena. Clinics include practical application time riding outside of the arena. "Basics to Bridle" Unique, one-of-a-kind opportunity! This private program looks into the techniques involved in advancing you and your horse through the levels from basic foundation to the finely finished bridle horse. Please contact us for detailed information and scheduling for this one-of-a-kind program. For those wanting more private, individual, or small group sessions we offer the opportunity to cone to the ranch for a short while or a long while. 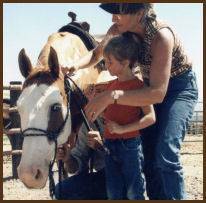 Bring your own horse or learn on an MJ Rising H Ranch horse. All ages and riding levels welcome.